THIS is tuna – the fruit of the cactus. It tastes a little like a kiwi crossed with citrus. When I told my Mexican friends that in America, tuna is a fish, they thought that was pretty funny. Everyone knows the fish is called atun! Well, now you know too. Forgive me for adapting that old drinking song to the occasion. I walked into a grill to get some dinner and found this lovely collection of one of Mexico’s traditional spirits. Mezcal, a relative of its smoother cousin,Tequila, is distilled from the heart of the maguey plant (a form of agave). In a process that has remained relatively unchanged for centuries, the heart of the plant is cooked in an earthen mound over hot rocks, for about three days. This gives the mezcal its distinctive smoky flavor. The roasted agave hearts are then crushed and fermented in large vats with water. When fermented, the liquid is distilled in clay or copper pots, and sometimes mixed with fruits and spices, such as apple or cinnamon, or other ingredients as family recipes dictate. Then it is distilled again to raise the alcohol content. It can be consumed raw at this point, or allowed to age anywhere from 3 months to 4 years, the alcohol content growing yet the liquor becoming smoother with age. The raw liquor is called white due to its color, and reminiscent of “white lightening” in the hills of Appalachia, this aguardiente (literally fiery water) reportedly burns all the way down. And due to its high alcohol content is highly intoxicating. 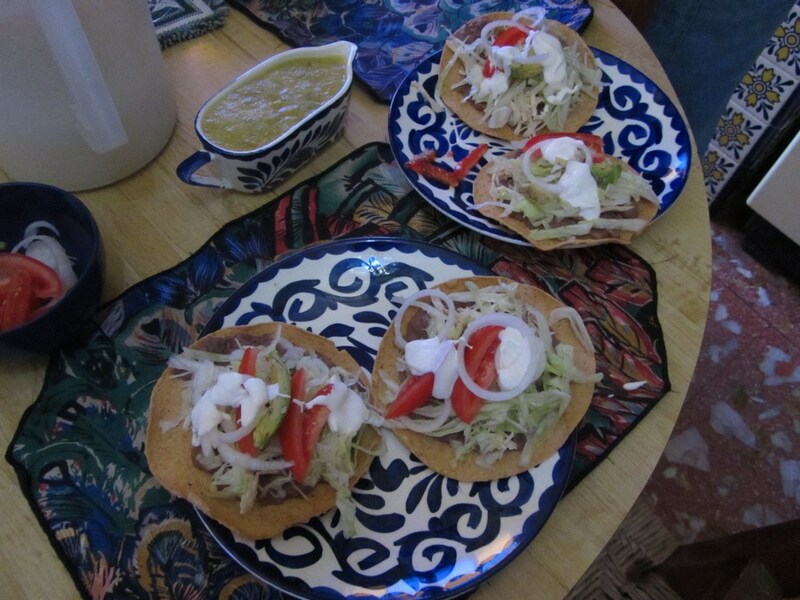 If you have ever eaten a tostada, you know that it can be a challenge. 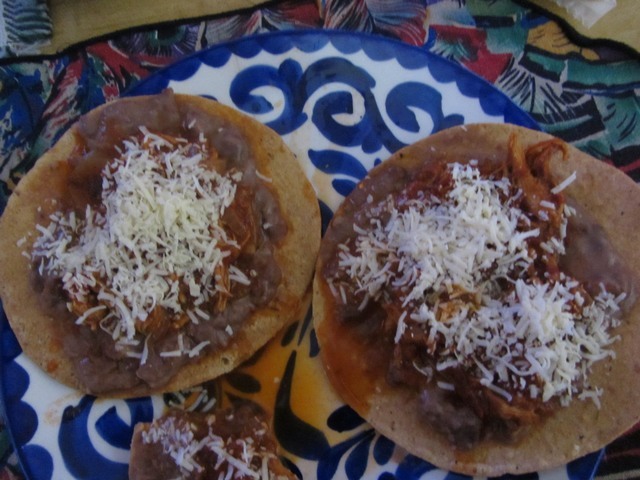 We had tostadas for lunch the other day. I was up for the challenge. I had neatly polished off one and started on my second when a couple of bites in, it suddenly cracked and fell out of my hand landing upside down on the placemat. I heard that. Not only that, but I understood that. Now what kind of thing is that to say?!!!! We all had a good laugh, when he realized that I understood him. Psst…the secret is to let the tostada sit a little while so the toppings have a chance to soften the tortilla a little before you try to bite into them. 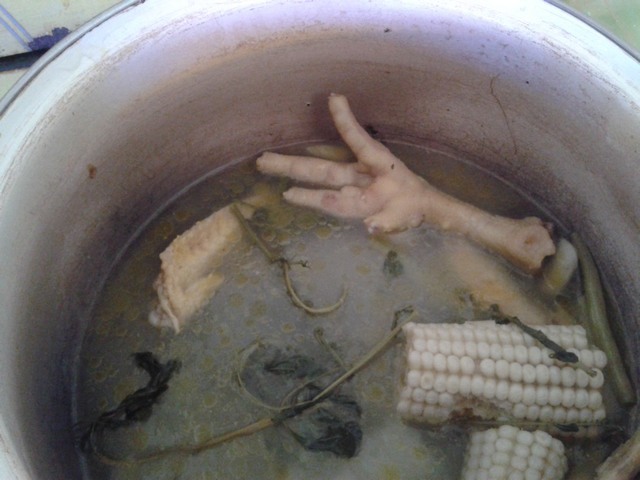 Recently I wrote about chicken feet in my soup. 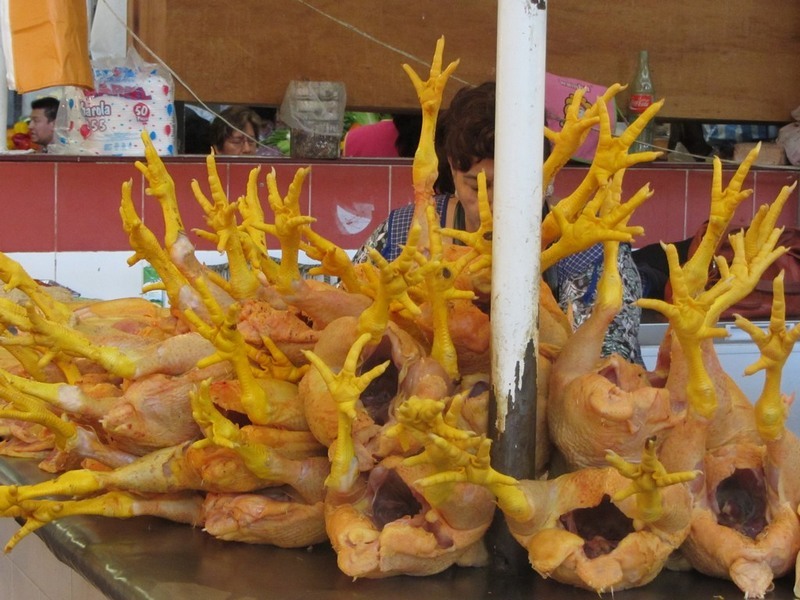 I have heard from my readers and confirmed with my hostess that chicken feet are a delicacy to be savored not just here in Mexico but in other parts of the world as well. Now, I have eaten some strange things out of politeness but if offered chicken feet, I’m not sure I could eat one. Reminds me of a scene in an Indiana Jones movie, where he was served monkey brain soup with eyeballs floating in it. Ewww!!! Of course that is what they said when I told them that I had eaten alligator, raccoon, and rattlesnake. And, no, they do NOT taste like chicken. The word of the day is “la gripa,” cold or flu. Even though it is sunny and warm, it is cold season in Mexico, just as it is in the States. And just like everywhere, when one person brings home a cold or the flu, they generously share it with other family members. When Irma was under the weather recently (now there is one of those “what does that mean?” expressions), I thought I would make chicken soup to help her feel better faster. I was busily chopping onion and garlic while the chicken was starting to simmer in the pot when she appeared to fulfill her duty to make lunch. When she insisted on handing me the alphabet macaroni (something I was never fond of except for spelling practice), I had to explain that I was making “sopa Americana por la enferma” (American soup for the sick) or she would have nothing of it. Later when the hot, fragrant broth was set before her, she gingerly tasted it and declared it “muy bueno” very good. Here, the treatment for what ails you — whether la gripa, a broken bone, anxiety, depression, or anything in between — is sopa made with alphabets in a tomato broth. Apparently, they believe in the healing capacity of alphabet soup as we do in chicken broth. Science just might disagree though, as this article from Web MD points out. It is not like Mexicans do not make chicken soup, as this photo of a recent lunch will attest to. I always wondered what they did with these. As an amusing anecdote. An American friend of mine once told me about when he and his wife first moved to a small town in Mexico. Chicken feet were highly valued, and chicken breasts were almost given away. They said they never ate better. My grandmother always preferred what she called the “Shteets,” those two tiny specks of meat “that jump over the fence last” (the tail bone). I was never really sure if she liked that part best or she was making sure that everyone else ate high off the bird while she was satisfied with a bite or two. What is your favorite remedy for a cold? In a blender blend the parsley with 1\2 quart water and add it to the rest of the water in a 1/2 gallon pitcher. 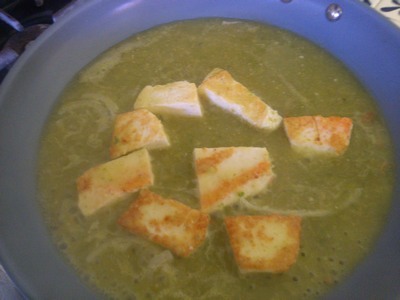 Blend the cucumber with some of the parsley water in the pitcher, strain through a colander into the pitcher. Do the same with the pineapple. Squeeze the lime(s) and add to green water. Stir well and serve. If you prefer a little sweeter, add a little sugar or mix with lemonade instead of water. Best fresh, but drink within 24 hours. * Ingredients are not exact, start with approximately equal parts of parsley, cucumber and pineapple, then adjust to your taste. The word of the day is “queso.” Cheese in English. 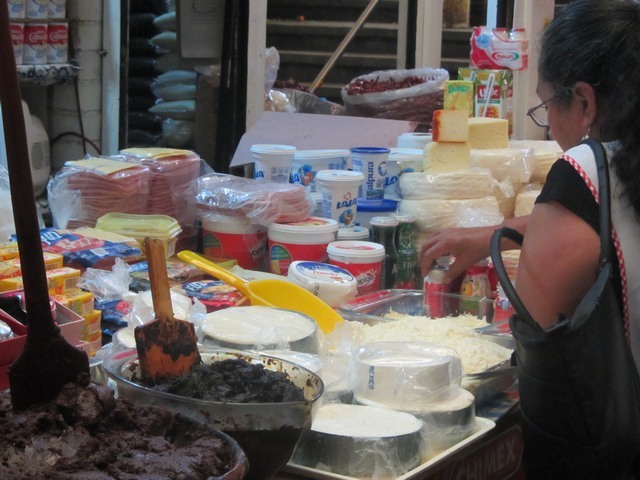 In Mexico they only have a few kinds of cheese and except for queso Oaxaca (Mexican string cheese) they are all pretty much the same, only varying in ripeness (aging) and, thus, firmness and stronger flavor. 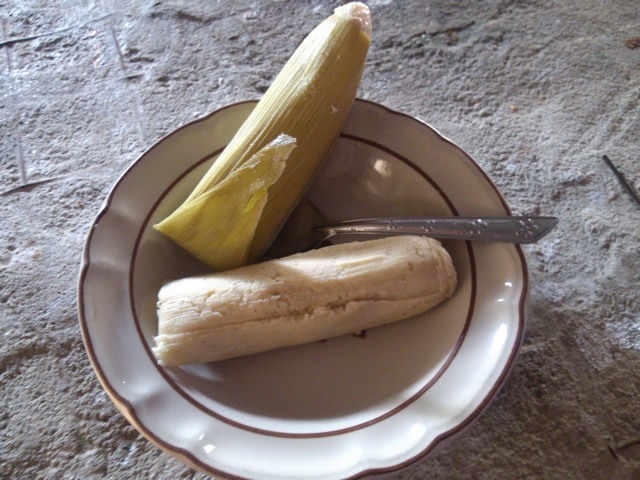 The way I, a gringo, see it is that they have the kind that crumbles, the hard kind either grated or whole, and Oaxaca. Little do I know! Once a week, a friend of mine who lives in Buena Vista, a small town near Taxco, comes to town bearing handmade cheese that everyone says is “the best.” I decided to get some for the house and was asked what kind I wanted. I knew I wanted Oaxaca (for quesadillas or just eating) and I wanted the kind that crumbles to put on tacos, tostadas, etc. so that is what I asked for. Still confused about “what kind” of cheese I wanted, he told me he would send a message in Spanish and would I please show it to Irma and have her respond. But Irma, not having her “lentes” (glasses), could not read the message, so I handed my phone to her grandson to read and reply in Spanish. A very lively conversation discussing cheese names ensued between them. I imagine, she just buys it, like I do, hard, soft or crumbly, from the cheese stalls in the “mercado” (market.) Finally, they settled on a couple kinds by name (manchego or criollo), then changed their minds and asked for cotija or criollo. To which he replied, “Just a little hard. Don’t worry,” which had me laughing even harder. 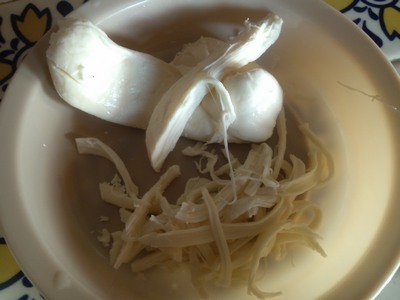 Queso Fresco (Fresh cheese): Aged only a few days, it is soft and crumbly and can be used like feta. (I think this may be the kind I was thinking of.) I have since learned that cheese here is made from raw milk and because this cheese is not aged very long, it can possibly carry a bacteria that can make you sick. You should definitely cook it. Queso Cotija: A hard cheese that is sold in rounds or grated from large blocks. The unique thing about this cheese is that it does not melt, it only softens, making it perfect for Chile con Queso – where you brown the cheese on a griddle, then serve it in chile verde sauce like soup. Yummy. The browned cheese is delicious all by itself too. Queso Criollo: Is a local cheese made only here in the state of Guerrero. It appears, by its use, to be similar in nature to Cotija. Better to crumble this kind than Fresco. My favorite, because we have nothing like it in the States, comes in broad strands that resemble string cheese, only softer. It’s unique texture comes from stretching the cheese as it is made. Pull it apart and put it on beans, tostadas, or soups, or because it melts wonderfully, in quesadillas. I will often buy a few pesos worth for an easy snack on the go. And then of course there is that other dairy product — crema, a thick fresh or slightly sour cream (like the French creme fraiche) that is dolloped on tacos, tostadas, and in soups. For a description of other Mexican cheeses and some delicious sounding recipes, see the Mexican cheese article in Epicurious.